All is right in the world because I’ve created us a hummingbird mimosa, aka our new signature spring cocktail. It’s here! 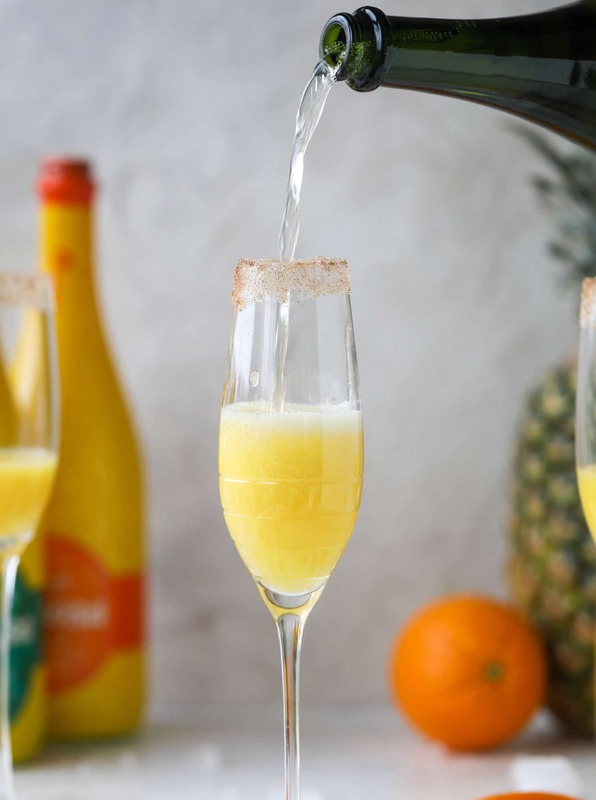 The hummingbird mimosa is a little flute of refreshing flavor and you’re going to love.it. Like love it so much that you spontaneously send out a text invite to all your (real, not internet) friends to come over for brunch this weekend just so you can make these. But the stand out were the s. They come in a bottle – already mixed! – and were heavenly. There is an orange variety on sale all spring and summer as well as a pineapple variety out for a limited time and I can’t believe how wonderful these tasted. Both are made with freshly squeezed juice too! It would be an understatement to say I am obsessed with this concept. I love that the entire drink is in one bottle, ready to grab and go. It’s so EASY. It’s so portable! 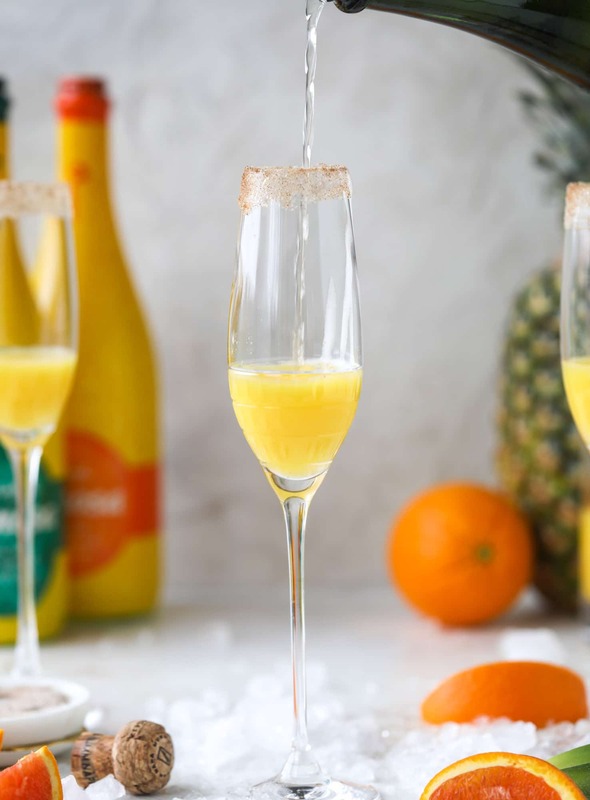 Instead of grabbing (at least) two bottles to take traveling mimosas to all of your spring brunch parties and holidays, you just have to grab one. Eddie and I also love having the occasional mimosa, so the fact that it’s here for me in one bottle? So freaking excited. And they are available NOW and only $8.99 a bottle. Hello lover. I was instantly inspired to create my own mimosa with these flavors. Also focusing on the taste of a springtime cake that I love! Hummingbird cake is such a favorite of mine because it has alllll the good things: pineapple, orange, banana, coconut and cinnamon. Not to mention that it’s blanketed in cream cheese frosting. Who could say no to that? Can we do a cream cheese frosting mimosa?! So the hummingbird mimosa was born! Yes yes yes. The combination of orange and pineapple juice is so super refreshing. It’s bright! I used cinnamon sugar to rim the glass for that classic hummingbird spice too. With chilled champagne, it is the perfect drink for spring. I love this so much! And it’s different enough from the classic mimosa but fresh and flavorful enough that EVERYONE will want one. Good problem to have, right? Of course, if you want the recipe to be even quicker, you can just grab the bottled mimosas from ALDI to replace the juice and champagne! 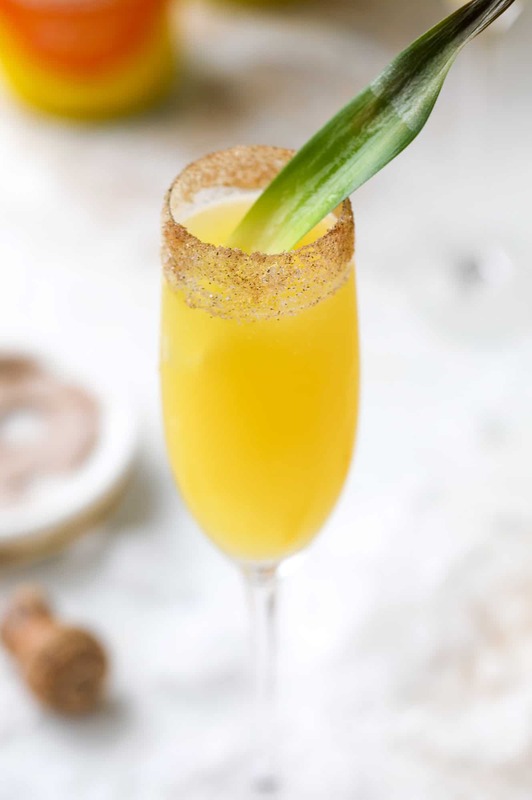 The hummingbird mimosa is a spin on the classic hummingbird cake: pineapple juice, orange juice, champagne and a cinnamon sugar rim! Stir the sugar and cinnamon together on a plate. Use an orange wedge to rim the edge of the glass, then dip the glass in the cinnamon sugar. Fill the glass with the pineapple and orange juice. Top it off with champagne. Serve! If you want this recipe to be even quicker, you can grab the ALDI Mimosas in a bottle instead! Let’s just serve it alongside hummingbird cake or scones.